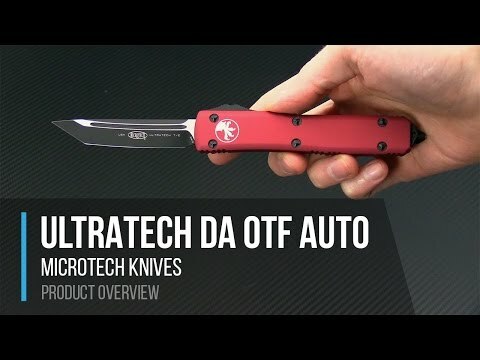 The Ultratech Zombie Tech dual action out the front automatic knife from Microtech sets the standard for the category. 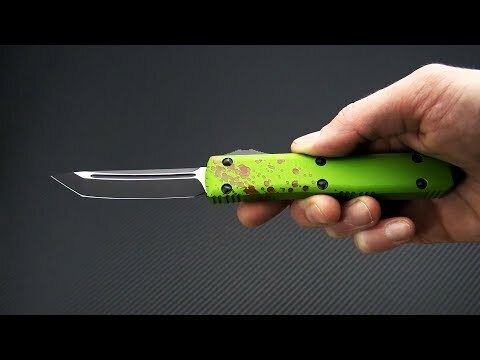 This version has a zombified, "blood splattered" toxic green anodized aluminium construction and premium stainless steel Tanto blade with black coating. Blade: Equipped with a brilliant two-tone black/satin finish, the Tanto point has a plain standard cutting edge. The Tanto has a refined point and is built from high performance stainless steel. The grinds and fullers are Black Cerakote coated while the flats and spine are a shiny satin. The 3.44 inch blade features a double action opening and retracting mechanism. Simply move the thumb slide on the side of the handle up to deploy and down to retract. An internal spring remains at rest in both the open and closed position to reduce wear. The action is smooth and fast. Handle: Smooth, Zombie anodized 6061-T6 aluminum has contoured edges creating not only a comfortable feel in-hand but a smooth transition in and out of your pocket. There are several areas of machine-grooved texturing around the outsides aiding in grip. This lighter more ergonomic grip is easy on the hands and eyes. The handle's construction is completed with Microtech's black proprietary hardware, glass breaker end and black pocket clip with Logo/Zombie Tech inscribed.